This is the last one in the Ruins of Old Earth. I had no idea how many ruins we have all over the place. Megalithic structures as well. Huge. The only negative I can think of is that it moved too quickly from place to place to see which country we were in, but it is workable though. Thanks Elen and I agree about moving way to fast.............as well as way to much pointing at what from afar look like something but Ruins?? Hi Sandy, I must admit I haven't watched them all yet. I have seen a few smaller compilations before. Thanks Elen, yes oops I entered the wrong number! I think there is a mix of origins to these land forms and ruins. Some of them are ruins, so yes, made as buildings out of building materials originally. Others I feel are expressions of land. As the hexagon is made by bees, an insect, so considered more conscious than a flower or a rock, yet both of these exhibit at least a loose adherence to geometric laws. But then there is the microscopic. Pollen are polygons. :-) Electron microscope craziness. Tessellations and tiling everywhere. These videos, by the looks of what I have seen, prove that Sophia is alive. That Earth has a skin which has memory and it is a huge energetic force with her elements and magnets and magma. Boiling mud makes a splash from bubbling below, a drop of water makes a splash too. The crowns and rings similar. But not the same. But still perfect in that same old persistent way. Some of these places are tattoos, put there by inhabitants. Some are notes saying I love you. Some are footprints of cities. Imagine the lines of Washington DC in an equivalent scenario. Some are scars that have healed. Some are directly made by the planetary being and are ulcers bought on by a choice of things. Maybe mostly by parasites. Which is an interesting trigger word. A parasite is usually some being which does not collaborate 'fairly' with it surroundings. It is also a stowaway, or a leech. Luckily the Earth is pretty compromising and forgiving, maybe even loving. The conscious of this planet has had to learn to create. Well it hasn't really. But it has had to evolve and build its ability to perform more and more creative feats. Stocking her palette or materials to create with. The consciousness for 'many, many years' exceeded the physical ability to do. The creation story. Rangi and Papa Mother Earth and Father Sky. Rangi is the sky, the father of all things; Papa is the earth, the mother of all things. In the beginning there was darkness, and these two, the earth and the sky, lay together. They had many children, who lay between them. It was dark for many ages; there was as yet no world with its bright light. Last edited by enjoy being, 6th October 2015 at 01:15. Another thing I thought to add. I saw reference in one of the videos in this thread (I think) of the concept and word "Mana" from South American artifacts and spirituality. This exact same word and meaning is used in the Maori culture of New Zealand. Hmm, not sure which video it was in now! I image searched one of the images I saved from this information and it related back to Klaus Dona. This was the image. Last edited by enjoy being, 7th October 2015 at 18:45. Hi Nothing, sometimes mana can be looked at the same way the word awhi is, no real English word to describe it properly. Ps Thankyou Ellen, love the data. Gidday Aianawa, yes I agree.The definition of being an indescribable force. Awhi means to hug or cuddle, the concept of Mana around the pacific would also include, love, and 'the higher good'. Embracing the flow of life. You can sense the meaning more than put words to it. Sometimes in New Zealand as you will know, it is said people with charisma or spiritual presence, have great mana. This is but only a very small part of the concept huh. And seems to be concentrated on as a definition among certain people who feel the need for this to be the meaning. And if anything it is misleading and egocentric. My intention in saying the definition was exact to the South American definition, is that it too calls it a sometimes supernatural force which can't readily be described.. or something to that affect. Thanks for highlighting the need to clarify this. But yes as you say, hard to describe in words, especially just one word. I would imagine prana to be another word used to relate to the same thing in some ways. Oh and I guess the idea of hug/cuddle extends to protect/ encapsulate/womb/nurturing field/aura. Last edited by enjoy being, 8th October 2015 at 13:20. This is 1/3. She could not upload the entire documentary and so more to follow. Last edited by Elen, 16th October 2015 at 07:03. This is predominantly from St Petersburg, Russia and it's distorted history. Google will translate into English, if you're interested. Hi all. I’m making a little synopsis on the documentary of St Petersburg. From what I gather, St Petersburg was the Capital City of the Empire, which predates any other big city in the world. It has megalithic structures all over which can be seen from the pictures and this is not Peru, but it has the same building techniques. I took a look at the maps, they are not easy to follow if you do not know what to look for, but I see now that the Survivors always made very straight lines as a rule and from that, you can check the dates on the maps to make a timeframe. If the streets are straight, they come from the Survivors. The huge megalithic column in St Peter’s Square is impressive in it’s size and the historical explanation of how it was built is so ridiculous that it is stupefying, really. There is, however, a drawing/sketch made by an unknown contemporary artist, which shows what it looked like, to him/her, in the construction of it. The Winter Palace is facing the old North direction, not the new North. You’ll see a lot of the interior here and wow! Somebody who turned out to be a Freemason replaced King Peter in a Cue de Tat. He was much older than the real king and also decorated the whole Capital with Freemason symbols. When you see the statues, which are all over the City, they are always clothed very light and in sandals. Doesn’t that show you that the climate was indeed different when they were made? In some cases they replaced the head with Peter’s, but gave up on ALL of the other statues. Shows you, the parasites are thorough in some places, but sloppy in others. The statues look very Roman to me, or what we today call Roman. St Petersburg has also been in at least one flood, and there are definite signs. In many places the ground floor is underground which can be seen easily from inside the buildings, when the windows look straight into earth or mud. Let’s admit it, we do not really know our true history completely yet. Hope you find it interesting as well. I find it very interesting Elen, I also enjoy reading a summery of the videos. I am being more accustomed to her accent, but I do at times miss vital information if I am not concentrating. Love the videos and the information that is being presented. I like my mind and the places it takes me. I have been watching all the episodes in your series and I think you have done an outstanding job. I particularly enjoyed PART 36 of the survivor series on St. Petersburg. Your buried city observations are spot on for similar conditions can be seen all over the world. The Roman Forum for example is 30 feet below street level. The city was clearly buried at some point. Even newer cities in America have the same signs. Older buildings maybe 200 years old are buried up to their windows New York, Philadelphia, Boston, and Washinton DC. How can an entire city be buried in fairly recent times? How can such a strange hoax be pulled off without people noticing? I think there may be answer to that. Wasn't St. Petersburg burned by Napoleon around this same time. Destroying evidence of Survivor civilization is a time worn trick. 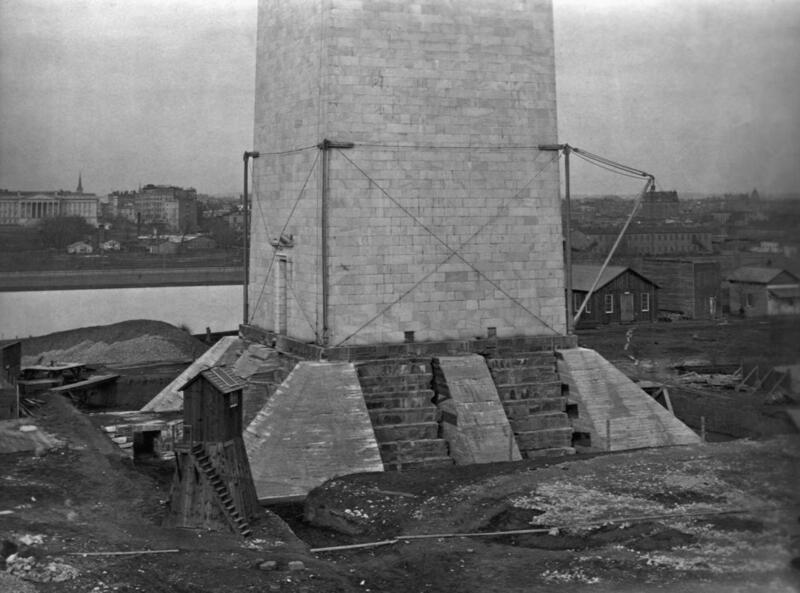 I would also like to share with you some rare photos of the Washington Monument when it was under construction. The Washington Monument was built on top of some much older structure. Newer brick work and cement being patch around a much older foundation. Clearly ancient. Modern workers for size comparison at the top. These are large stones weighing 20 tons originally lifted 500 feet in the air in the 1800s. Clearly there is evidence of neolithic under the monument. Even the monument itself is quite impressive. Very large 20 ton stones were lifted 500ft in the air. When the monument was damaged in the 2011 Earthquake they covered the whole structure in netting so nobody could see the repairs being done. Nobody must see the masons work their magic. Thank you very much for your post, Novusod. Loved the pictures and your observations on New York and Washington DC. That is very interesting, I'm sure there are many other sites where there is signs of floods and sinking cities. I must, however, set the record straight: I did not produce this series. All the praise and credit must go to NewEarth. All I did, was discover her work and helping her spread the news. She herself does not claim to know everything and is basing her knowledge on Russian scientists and archeologists. Me? I am grateful that I am able to comprehend this much and connecting dots without drawing conclusions that will shut the door for more knowledge to be revealed. Thank you for your considerations, we are all in this together my friend.